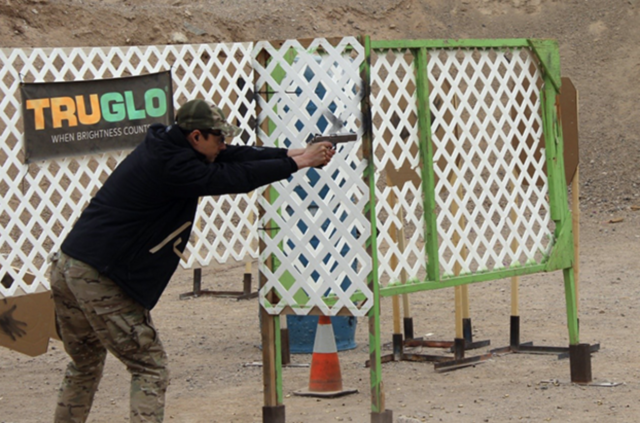 International Defensive Pistol Association (IDPA) has changed. Over the course of the last several years, IDPA has made multiple substantial changes to its rulebook to the delight of some and the lamenting of others. Just like our own Constitution, IDPA’s rulebook is a “living” document and changes to keep up with the times. Sometimes you get prohibition-type rules that are quickly repealed, and sometimes you get lasting rules that change the sport for the better. I was thrust headfirst into these changes as I recently competed in the 2018 South Mountain Showdown presented by Healy Arms at the Phoenix Rod and Gun Club. Unfortunately, I hadn’t competed in IDPA in a while — not out of a loss of love, but more out of the inconvenience of driving almost an hour to get to my local club. I am fortunate to live about 15 minutes from the Rio Salado Sportsmen’s Club, and my propensity to sleep in and still make the 11 a.m. start time for USPSA or 3-Gun at Rio Salado fits me like a glove. Rio Salado hasn’t had an active IDPA club in years (newly rectified), and though I longed to shoot IDPA, I couldn’t drag myself an hour away most weekends. But a late-night browsing of Practiscore revealed an opening for the 2018 South Mountain Showdown, and I quickly signed up. If anything will get me out of bed at 6 a.m. on a Saturday, it is the chance to compete with hundreds of shooters to test my skills. The match director informed me via email that since I hadn’t classified in a year that I would still be allowed to compete but not for score. I was slightly annoyed at this since I had finished well the last time I shot the match and received a nice plaque. Luckily, IDPA’s prize tables are random, so at least I was still in the running for a trinket. With my match essentially now turning into a major practice session, I made a last-minute decision to use my 3-Gun STI Eagle in the ESP Division after years of only competing with my Glock 34 in SSP. I downloaded a copy of the latest rulebook and perused the Brian Enos forums attempting to catch up on what I’d missed over the last year or so in the IDPA world. After putting myself to sleep reading the rulebook I decided I would just “wing it” the next day and figure it out. This is supposed to be real-world shooting, so staying up late studying for IDPA seemed like a thoroughly un-real-world scenario. I set the alarm for 6 a.m. and passed out. I sleepily joined my squad the next day and was pleasantly surprised to see Rob Leatham and other top shooters among our ranks. I enjoy shooting with the pros mainly because I can watch their expert stage runs and glean some “free” knowledge. As a bonus, Rob is pretty much nonstop entertainment and kept our squad laughing from the first minute until the last. I was randomly assigned to be the second shooter, so I only had a chance to watch one competitor under the new rules before I was called to shoot. I pretended to know the new rules and asked a quick question of the SO when no one was looking. After shooting the stage, I am happy to say that I posted one of the fastest times of my squad. Unfortunately for me, those little half-second penalties now equate to a full second for each point down. Too much 3-Gun had me mowing through targets in a “two hits anywhere” mentality, and my time astoundingly doubled when all the points were tallied. That’s when I decided that “winging” the new rules wasn’t going to work. I started asking questions and pulled out my rulebook trying to learn everything I could before the next stage. I’ll save you the panic and trouble I experienced and cut to the important changes I learned. Obviously, the first major change is the new scoring system. Your points down are no longer cut in half, but instead correspond to exactly what the target says. Down 0, Down 1, etc. The head, which used to encompass an entire down 0 section, has now been further narrowed to a small circle for the Down 0 score with the rest of the head being down 1. This was a major controversy for some, and the eternal accuracy vs. speed debate is alive and well. 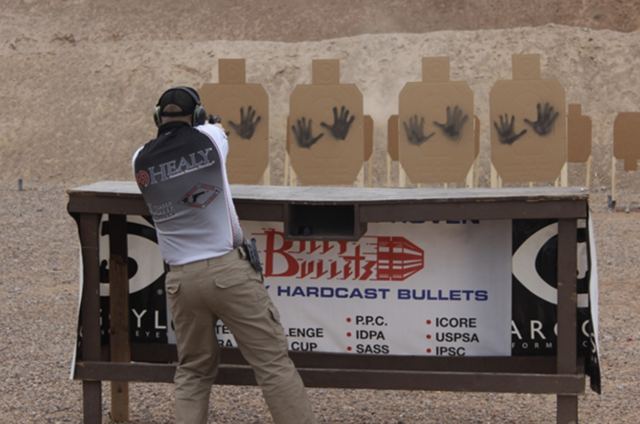 I had been exposed to this type of scoring system through the NRA TPC Police Competitions my team competes in, so it wasn’t as much as a shock as the first time I experienced it years ago. Does it slow you down? Absolutely, but it makes you really think about accuracy as you pull that trigger. 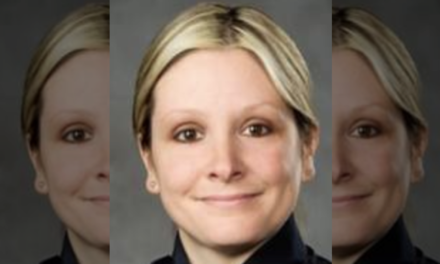 In my line of work — or anyone that carries a weapon for self-defense — that isn’t a bad thing. This new scoring system definitely draws an accuracy line between itself and the other organizations, and I think it was a good move. Once you get your mindset right about slowing down, you can then retrain yourself to bring the speed up (of course, easier said than done). Also of note is the removal of the “failure to neutralize” penalty for not having at least a Down 1 hit. The ability to re-engage targets from any shooting position as long as it doesn’t violate the 180 or another rule and tactical sequence is now gone as well. Subjective “cover” calls are now also gone. USPSA-style fault lines have been installed, and as long as you stay within them you will now be in cover. This eliminates any debate on whether you were hanging out slightly or if one competitor was getting a generous cover allowance. 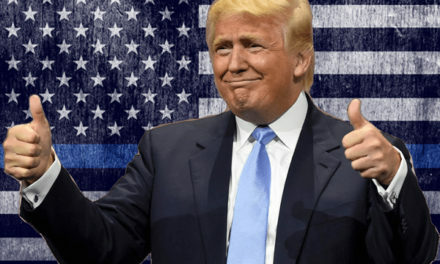 This cuts down on SO commands and distractions to the shooter, and again I think it’s another good move. The final area addresses the formerly complicated reload issues. I won’t give a history lesson on the convoluted history of IDPA reloads and taking steps and reloading in the open, etc. You can now reload anywhere as long as you’re not exposed to unengaged targets, and thankfully now if you run dry in the open you can reload and continue to engage targets without having to run to cover, reload and re-engage. With all of that new knowledge crammed into my head, I shot my next stage to essentially the same result. With two penalty-filled stages complete, I was now determined to get it right by Stage 3. The next stage had you start in front of a large table with your firearm and magazine on a lower shelf. In front of the table were four no-shoot targets with only inches in between each target. These no-shoot targets served to obstruct your view of eight targets in a row at 20 yards. This stage was perfect in the sense that I wasn’t tempted to run and gun but had to stay in a confined area and make precision shots. It worked perfectly, and I completed the stage in a healthy time and made good, consistent hits. With a little success and confidence under my belt, my scores improved consistently and so did the fun factor. No Arizona match is complete without at least one “horse” stage, whether it’s 3-Gun or Pistol, and our final stage had us mounting a barrel horse complete with a talking horse-head plush doll and plastic saber. It was a great way to end the match and made some fun photos for all. With the match complete, we gathered at the shooting pavilion and awaited the results. Healy Arms and the other sponsors filled a generous prize table complete with guns, Dillion presses, holsters, etc. 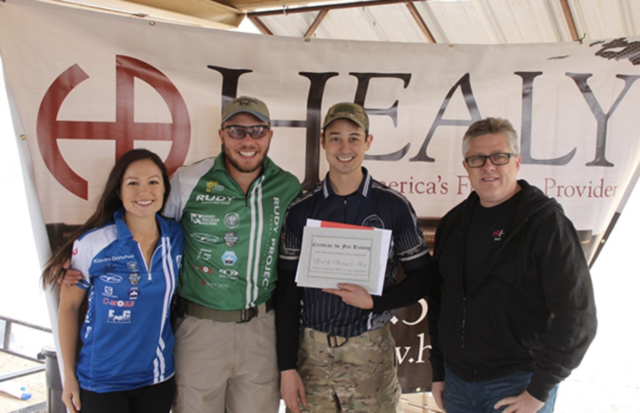 Healy Arms is a great local firearms business born out of the back of an insurance company, and you couldn’t ask for a nicer group of people to sponsor your match. 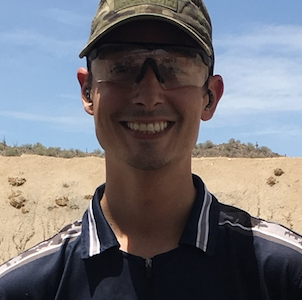 While everyone was eyeing the prize table, I spoke with several of my squadmates who had traveled from Michigan to shoot the match as well as attend local IPSC World Champion and USPSA National Champion Elias Frangoulis’ shooting clinic the next day. I spotted a certificate for his course on the prize table and joked that a new gun or trinket wouldn’t help your shooting as much as that certificate would. Though I’m unlucky in shooting order, I am extraordinarily lucky in prize drawings. I was picked randomly early on and ran past the prize table items to grab the certificate. The top shooters quickly grinned and pointed out my strategy in seeking out sage knowledge. After Elias accepted his plaque for overall match winner, I was able to meet him and his girlfriend, Kimiko Donahue (who not surprisingly won High Lady), and set up a future training session that will hopefully up my shooting game. With the awards ceremony complete, we all shook hands and promised to see each other next year. 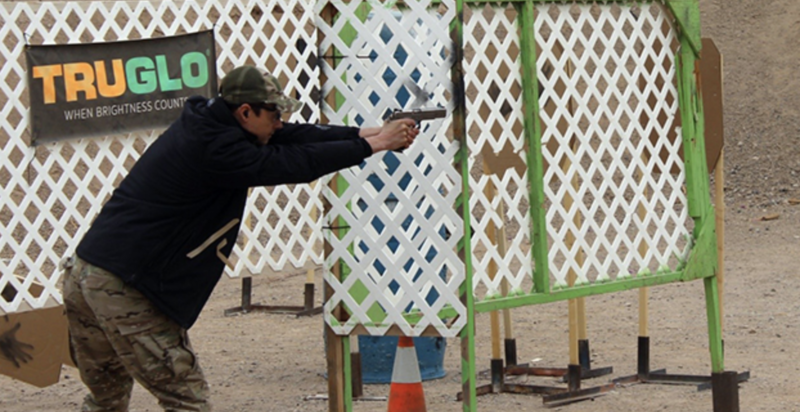 IDPA continues to change and evolve, and anyone looking to compete at the highest levels must evolve along with it. Shooting with pros like Rob Leatham continues to give me glimpses of what is possible with the right amount of training and discipline, and seeking out new instructors such as Elias Frangoulis will keep me on the right path. There will never be a perfect shooting organization, and I don’t want there to be one. Debating rules and equipment with your squadmates is much a part of the sport as the shooting itself, and I hope that never changes. I enjoy the challenge of shooting, and just when I think I’m getting comfortable, a new challenge, rule or division pops up renewing my enthusiasm for each new trial. So here’s to chasing perfection and hoping I’ll never attain it.